Quiz: Are You A Good Candidate For Self-Publishing? Self-publishing has turned the publishing industry upside down: Today many writers are choosing to publish their books themselves instead of pursuing the traditional route. But is self-publishing right for your personality? Take our self-test to find out! As long as the finished product is good, it doesn’t matter how you arrived at it. You want nothing to do with it; you’re a writer, not a cover designer. You would rather leave it to the experts. You’re happy to have feedback, as long as you have the right to ignore it. Nobody will ever do a better job on your writing than you. You’ll be flexible if it truly makes your book better. But you also think your story is pretty good as it is. You wouldn’t mind being guided by an expert and are willing to trust his or her recommendations. Sometimes, you’re even willing to accept doing something you don’t want to do. You love finding clever ways to share your writing news with friends and family, and you authentically get a kick out of participating online. You’re pretty comfortable on Facebook, but it doesn’t energize you. You could take it or leave it. Social media is a distraction from the real work of writing. You never know what to post, and when you do post something, you stress and fret that it won’t be positively accepted. You love talking about how enriching and fulfilling your life is in the same way that you love hearing about other people’s triumphs. Hand-selling your book sounds like fun! You have neither positive or negative feelings about sharing your achievements; it’s the achievement itself that matters most. You tend to feel like you’re “bragging” and rarely talk about the good things you’ve done. You’re a wiz at streamlining and delegating. You see these tasks as necessary evils and do your best to get them done. Just knowing you have to manage them drains your energy and negatively affects you. You are a CEO. If you want something done right, you do it yourself. You dive headfirst into new adventures and challenges—even the ones that intimidate you. You are glad to delegate tasks you don’t love but embrace the things you’re good at. You are willing to learn new things when necessary, such as web design and social media, even if you don’t love them. You are not a “business person”—you’re a writer. A darn good one. And your dream is to not have anything to do but write all day. So, Are You A Good Candidate For Self-Publishing? MOSTLY 1: You could be a great self-published author—you might even be an artisan author! You embrace not only writing, but the publishing process. Your confidence, energy, and enthusiasm will motivate you to create a polished book! MOSTLY 2: You might be a great candidate for collaborating with self-publishing experts, rather than doing it alone. When you self-publish with a company like Self-Publishing Relief, you work with a team of experts and delegate tasks to them, but you still maintain control of the process. That said, you’re in a good position to be flexible: You could follow the example of people who selected mostly A or C. You have a lot of opportunities open to you! MOSTLY 3: You’re a writer’s writer, to be sure, and we admire your single-minded focus on your craft. You might prefer being published by a traditional publishing house: In order to stay focused on writing, you’re willing to give up some autonomy when it comes to marketing, cover art, etc. Question: How did you score on this self-publishing personality quiz? 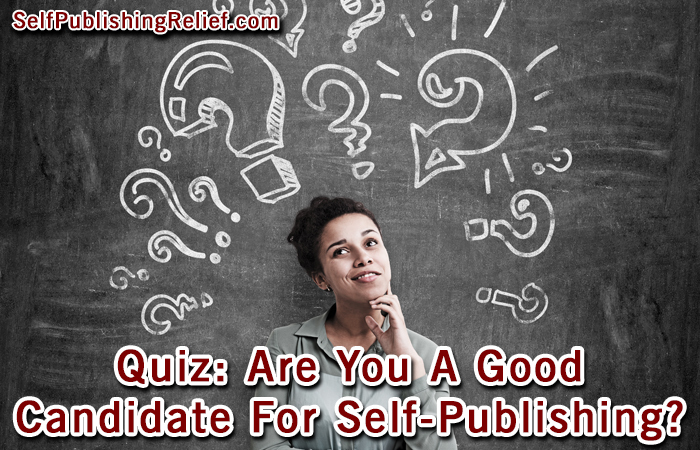 4 Responses to Quiz: Are You A Good Candidate For Self-Publishing? Cover art, characters, what about the layout of the book itself? A major reason I self-publish (besides that I don’t want to go thru a few years of rejections/waiting for pre-press)is because I have many books with complex layouts, and it’s easier for me to create them WSYWYG than to try to keep track of what I’m saying in a single text-stream manuscript format. The one time I had a contract with a publisher, they wanted everything (main text stream, three different kinds of sidebars) in one double-spaced document (claimed that made it easier “for both of us”). I was actually relieved when they cancelled on their end (they also expected me to get this–200,000+ words and 50+ photos–done in a month). Do you have any idea how hard it is to keep track of what you’re saying when your main text stream has 5-6 page interruptions in it? Your ‘quiz didn’t give me any options, and there was no A B or C, just numbered questions? Did you make a mistake or did I? The answers are numbered 1, 2, and 3. Keep track of the numbers of the answers you choose. Your result is at the bottom of the article, based on whether you have more 1s, 2s, or 3s as your answers. I like control of my craft but I am very open to suggestions as well.I just don’t want a “this way or no way” attitude coming my way. I have always wanted to go old school with publishing and can visualize me sitting at a book signing, books piled high in front of me with eager listeners enjoying the excerpts I am reading! I’m eager to see my works in print in college journals as well. Old school rules!